With perfect pacing, the multi-award-winning, New York Times best-selling team of Mac Barnett and Jon Klassen dig down for a deadpan tale full of visual humor. Sam and Dave are on a mission. A mission to find something spectacular. So they dig a hole. And they keep digging. And they find . . . nothing. Yet the day turns out to be pretty spectacular after all. Attentive readers will be rewarded with a rare treasure in this witty story of looking for the extraordinary — and finding it in a manner you’d never expect. Mac Barnett is the author of several award-winning books for children, including President Taft Is Stuck in the Bath, illustrated by Chris Van Dusen, and Extra Yarn, illustrated by Jon Klassen, which won a Boston Globe–Horn Book Award and a Caldecott Honor. Mac Barnett lives in California. Jon Klassen is the author-illustrator of I Want My Hat Back, a Theodor Seuss Geisel Honor book, and This Is Not My Hat, winner of the Caldecott Medal. He is also the illustrator of House Held Up by Trees, written by Ted Kooser, which was named a New York Times Book Review Best Illustrated Children’s Book, and Extra Yarn, written by Mac Barnett, which won a Caldecott Honor. Originally from Niagara Falls, Ontario, Jon Klassen now lives in Los Angeles. A clever second collaboration between Barnett and Klassen... The prose is deadpan; the joke’s all in Klassen’s winsomely smudgy illustrations. Barnett’s well-chosen words and plentiful white space support readers. Klassen’s cross-section illustrations give readers a mole’s-eye view of the underground proceedings, extending the spare text with visual humor. As in his previous books, Klassen shows an uncanny knack for conveying meaning with the subtlest of eye movements. How fitting that the wordless final spread features a knowing look between the dog and a cat familiar to Klassen fans; all that’s missing from the trippy conclusion is the theme music from The Twilight Zone. Mind-blowing in the best possible way. When Sam and Dave dig a hole, readers get "something spectacular." The boys, on the other hand, do not. Their quest to find the spectacular brings them painfully and humorously close to buried jewels as they spade their way into the ground, accompanied by an intrepid canine companion. ... Poor Sam and Dave. Lucky readers. Barnett’s comic voice is at its driest as he recounts that quintessential American childhood activity—the digging of the giant hole. ... Cross-sections of earth show them further and further down, and comic tension erupts as readers see gigantic diamonds buried at intervals underground while Sam and Dave tunnel on, missing every one... They land in their own backyard again—or do they? Barnett and Klassen dangle the prospect of fantastic subterranean treasure before readers, but leave them with an even greater reward: a tantalizingly creepy and open-ended conclusion. The deliberately poker-faced, almost banal flatness of the text isn’t the joke here but the straight man to the ironic humor of the art (the boys’ elaborate subterranean efforts carefully lead them just past several increasingly huge diamonds). ... Engaging as well as stylish. Kids will enjoy playing “spot the differences” once they figure out the joke... Young excavators will appreciate this surreal modernization of the old notion of digging all the way to China. An understated, humorous, and charmingly perplexing tale. ... What works spectacularly is the clever play between words and pictures. As in Klassen’s "This Is Not My Hat," readers are in on a joke to which the characters are oblivious. Namely, that each time the boys change direction, they narrowly miss discovering increasingly enormous jewels hidden in the earth. .. Klassen’s use of muted earth tones and uncomplicated compositions is paired well with Barnett’s deadpan humor. 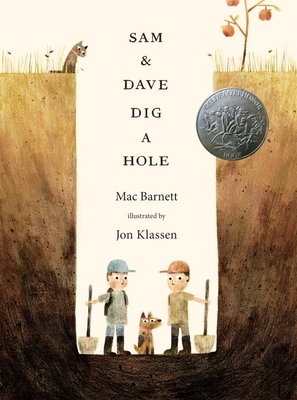 Klassen’s pebbly, earth-toned, colored-pencil and digital illustrations of Sam and Dave’s dig are exaggerated to comic effect, especially when coupled with Barnett’s dry, simple text. Subtle visual clues (the final absence of dirt on Sam’s and Dave’s clothes; a closing house that’s just slightly different from the opening one) suggest there’s more to the story than meets the eye, and canny little ones will likely be delighted by the beguiling ending. A funny, deadpan adventure... This is an exercise in suspending disbelief, which children will gladly undertake. ... A topsy-turvy treasure-seeking adventure. Mr. Barnett’s economical text works in droll counterpoint with illustrations that become subtly surreal. Soon the hole is so deep that the boys and the dog begin to plummet, only to land back in the soft dirt where they started. Or do they? Tiny clues suggest otherwise in this clever and faintly disconcerting adventure. Part wry comedy of errors, part Twilight Zone, this book feels timeless in that it could have been from 50 years ago, or from 50 years in the future (and possibly from another dimension). Part wry comedy of errors, part Twilight Zone, if you're digging through your shelves for something spectacular, look no further. A wryly subtle, unexpectedly funny picture book about two brothers in search of something extraordinary. ... As they dig deeper and deeper (and get dirtier and dirtier), readers will delight in spotting the spectacular items that lie just outside their shovels’ reach. Barnett’s deadpan text and Klassen’s equally restrained illustrations (the dog’s facial expressions alone are priceless) combine to create a picture book rich in dramatic irony and understated hilarity. The limited color palette (heavy on the earth tones, of course), imaginative text and surprising ending combine to create a collaboration that is itself nothing short of spectacular. A visually appealing underground adventure... Kids will love to read, reread and just look at this book. Is any childhood truly complete without at least one shovel-wielding foray into shoulder-deep dirt? ... A carefully choreographed interplay between Mac Barnett’s straight-faced text (“So they kept digging”) and Caldecott-winner Jon Klassen’s stylized illustrations. The beauty of this story is that it articulates something kids seem to intuitively know, but can't really explain with language. The way that Klassen's illustrations tel as much of the story as Barnett's words is absolutely brilliant. With Barnett's clever prose and Jon Klassen's sly illustrations, this book is one of the best of the year. Entertaining, funny and interesting... This picture-driven book engages the imagination with deadpan humor and dry wit. Marvelous. ... Jon Klassen's art, created digitally in colored pencil, adds witty and clever layers to a humorous story about friendship, strategic thinking and determination. This book is deadpan and dead-awesome. A masterwork in humor, subtlety, and surprise, Sam & Dave Dig a Hole will leave readers digging for the truth.